Recently, I have been asked to share a few of my favorite Christmas recipes - it's easiest to do here, so Merry Christmas to you from me! First off my "Cocoa for Two" cones. I got this idea from my friend Hollye - she makes these every year and told me where to get the cone shaped bags *and gave me some ideas for candies to top them with. Then I started getting inspired and came up with a few ideas of my own. In a large mixing bowl combine all ingredients; blend well. Store in tightly covered container. 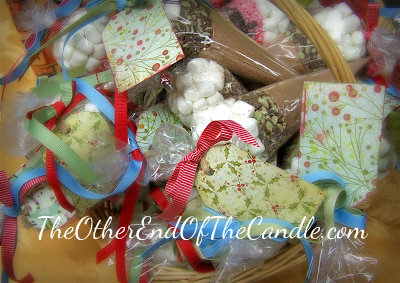 If you're bagging your Cocoa for gift giving, you'll want to include these directions. For a single serving: Combine 1/4 cup mix and 3/4 cup boiling water in cup or mug; stir to blend. Add marshmallows to hot cocoa, if desired. *Don't feel limited to the cone shaped bags. You could make a cute folded-over cardstock header with your spare paper-crafting supplies and just use a zip-top bag for your packaging. Or, how about a Mason jar or other up-cycled canister. To make the cones - add 1/2 cup mix to a cone, twist down tight and secure with the wire twistie that comes with the bags. Cut excess bag from the top. 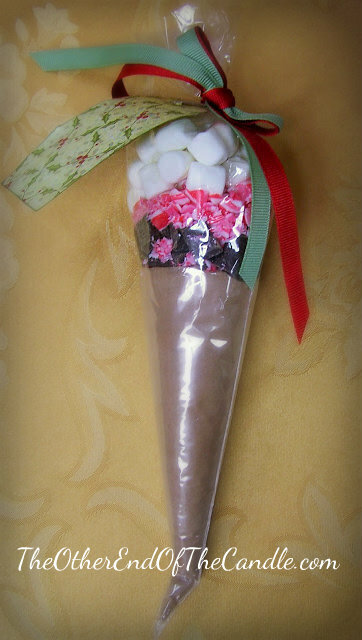 Drop cocoa mix cone into another cone and carefully add desired toppings. Varieties I used were Andes Mint, Pepper Mint, Toffee, and Double Chocolate chips. Add about 1/3 cup candies or chips and then 1/3 cup marshmallows on top of the candy toppings. Twist and secure the outer bag. Attach a tag with the directions to the top with some colorful ribbon. I ordered the Belgian chocolate cups online - but I don't recommend the site - the shipping was exorbitant! You can make your own or find another source... I once found some at Tuesday Morning for a steal! For the mousse I used a recipe from Hershey at their website. I've been making this one for years - I like it because it doesn't have any raw egg like a lot of mousse recipes do. In small cup, (I use a glass measure) sprinkle gelatin over cold water; let stand 1 minute to soften. Add boiling water; stir until gelatin is completely dissolved and mixture is clear. Cool slightly. Stir together sugar and cocoa in medium bowl; add whipping cream and vanilla. Beat on medium speed of electric mixer, scraping bottom of bowl occasionally, until mixture is stiff. Pour in gelatin mixture; beat until will blended. Refrigerate about 30 minutes before serving. Garnish as desired. 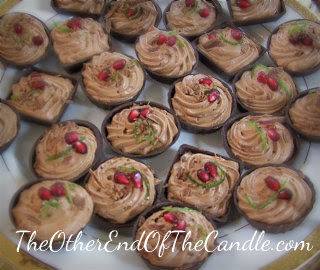 (I used tiny strips of lime zest tossed in sugar, pomegranate arils and chocolate shavings. Raspberries and mint leaves are nice too, or just chocolate shavings and another batch of mousse without the cocoa. This is really yummy layered in a trifle dish with layers of moist brownie and mini chocolate chips for garnish. Layer brownies in about 1 ½ inch squares, next chocolate mousse, white mousse, brownie etc. Cover and refrigerate leftover desserts. Melt butter over low heat; add brown sugar and Karo, bring to a boil for 5 minutes WITHOUT STIRRING. After 5 minutes, add vanilla. Pour over popcorn mixing and coating evenly. Bake at 250 degrees for 1 hour, turning every 15 minutes. If you double the recipe still cook the caramel for only 5 minutes. I loved the top two at the party they were wonderful may try the cones for the girls' to make next year!!! P.S. 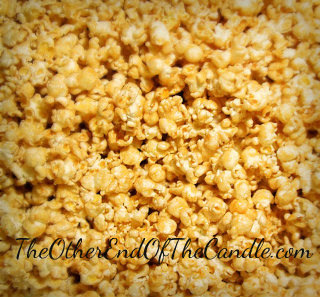 gonna have to make your caramel corn and see what the hubbs thinks he loves the stuff! Heather S. BTW Have a wonderful Christmas!!!!!!!!!!! And will we be finding one of these delectable treats in DH's can? I hope he's going to share! It was really nice of you to share your recipes. Thanks for sharing these, Sara!